After black flags in Assam, Modi to face 'Go back' posters in Andhra! After black flags in Assam, Modi faces ‘Go back’ posters in Andhra! A day after Prime Minister Narendra Modi was shown black flags during his Assam visit, posters and banners screaming ‘Go Back Modi’ came up in Andhra Pradesh ahead of his visit to the coastal State on Sunday. The posts of photographs of such posters and banners, which are being shared on the social media platforms, have already gone viral, reports India Today. It has been reported that on Sunday morning, the hashtag #GoBackModiAndhra was among the top trends on twitter in India. In one of the posters that are doing the rounds of social media, Prime Minister Narendra Modi was depicted in a caricature. The PM was seen running away from a crowd that is raining slogans like #NoMoreModi and #ModiIsAMistake. 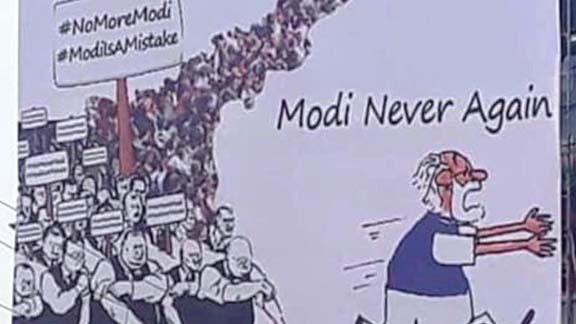 The poster has also the text ‘Modi never again’ on top of the PM’s caricature. Andhra is unwelcoming you Mr Prime Minister Modi….. ! You are the unwelcome Guest everywhere in India…! Please Confine yourself inside the PMO…! When People see you, They Get Anger and Protest…! It may be mentioned that protests against the controversial Citizenship (Amendment) Bill reached to a new level of intensity, as Prime Minister Modi was greeted with black flags after he landed in Guwahati on Friday evening. In an unprecedented incident, the students of Gauhati University mostly belonging to All Assam Students’ Union (AASU) and Krishak Mukri Sangram Samiti (KMSS) waved black flags to Modi near university campus in Jalukbari of Guwahati when his convoy was on its way to Raj Bhawan from LGBI Airport in Guwahati. The AASU members also showed black flags before Modi’s convoy at Latashil when it passed through MG Road. Prime Minister Modi faced black flag protest in Guwahati on second consecutive day on Saturday. Modi was shown black flags in at least two places in Guwahati as a mark of protest against the Citizenship (Amendment) Bill. He was also shown black ballons as he reached Changsari in Guwahati to lay foundation stones of three projects.